The European Union is seeking to establish itself as a player on the World political stage and to interfere in Israel more and more. The new constitution contains no reference to God, and according to Valery Giscard D’estang this is intentional "because we are secular". Gerhard Schroeder omitted, "with the help of God" from his inauguration promises. This E.U. poster, known as the construction site poster, showed a version of the Pieter Brueghel painting of the Tower of Babel with tower cranes resuming its construction where once God had intervened to halt the work. It proclaimed, "Europe – many tongues, one voice." The poster was withdrawn after Christians protested, but its production speaks volumes about European aspirations. A prominent Pentecostal minister was told by Romano Prodi that, "We like your social activities, but stop telling people you have the truth." Evangelicals are coming under pressure over activities that are, "not in line with EU", and the ICEJ is categorized as, "a racist cult group." So is Europe the Beast of Revelation chapter 13 ? Where did the European Union spring from ? There appear to be two forces which are driving the growth of the European Union, even though they appear to be in contradiction. One is the Roman Catholic Church and the other is Secular Humanism. The Roman Catholic church is a powerful supporter of the E.U. Three founding fathers of the E.U. are being beatified for founding the E.U. on Roman Catholic principles. 1 Acquis Communitaire Once the E.U. has acquired control over a nation's affairs, it keeps those powers forever. 2 Power The unelected commissioners decide everything. The E.U. 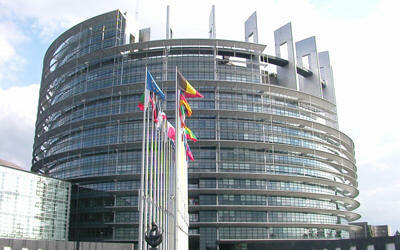 has a parliament, but its members (MEPs) have no effective power. 3 Structures of government A new nation of Europe can only be constructed by dismantling the structures of the existing nations. The UK Prime Minister Edward Heath said in 1972 that "there would be no loss of national sovereignty, but freely admitted in 1990 that he knew this statement to be untrue. One E.U. conference which should concern the evangelical Christian is the exchange of "best practice" in E.U. states on "regulating, monitoring and controlling cults and sects", (the word the Roman church uses for Protestant denominations). 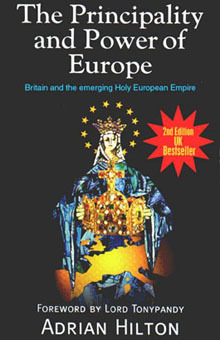 For an in depth study of the political, religious and spiritual background to the emergence of the European super state, seen from the point of view of Britain, this book is highly recommended. If you are unaware of the way the Holy Roman Empire of history is being recreated, this book will change your view of current political processes. This is particularly relevant in the context of Bible prophecy still awaiting fulfilment. You might have thought that Europe rooted out Anti-Semitism after the horrors of the Holocaust and the Nazis had been revealed. Perhaps Anti-Semitism was discredited, but it is alive and ugly now. In November 2003, the E.U. caused a storm with its poll, which came up with the finding that 59% of Europeans believe Israel is the greatest threat to world peace. The poll was actually conducted among 75,000 people from 15 countries, who had to select from fifteen countries, which one constituted the greatest threat to world peace. Israel came out above Iran, North Korea, Afghanistan, Iraq and the U.S.A. Why do Europeans apparently fear Israel more than al Qaeda, the Palestinians and Yasser Arafat? One obvious reason is the framing of the question; these terrorists were not included as they are not countries. Those fearful that the Palestinians would cause world war had to tick the Israel box. As Natan Sharansky observed, it is like the past, when the Jew was blamed for everybody’s problems. Now Israel is the Jew that Europe blames. In November 2003, the European Union's Monitoring Centre on Racism and Xenophobia decided to shelve its report on the rise of anti-Semitism in the Continent. The problem is that the survey had found that "many anti-Semitic incidents were carried out by Muslim and pro-Palestinian groups," and so a "political decision" was taken not to publish it because of "fears that it would increase hostility towards Muslims." Apparently, the EU's main concern about an actual epidemic of hate crimes against Jews is that it could provoke a hypothetical epidemic of hate crimes against Muslims. This has been a love /hate relationship, which turned to hate in 1973. (the time of the first Arab oil embargo) However, Israel was rewarded financially for the Oslo Process. Europe proposes that Jerusalem be made a "corpus separatum"; an independent city belonging to no-one. Chris Patten was proud of EU support for the Palestinian Authority – regardless of its terrorist activities. When challenged on the money funding terror, he said, "We don’t like to know that." There is a great need to refute the things that are said and believed about Israel, particularly by the academic and chattering classes. Indeed there is much to challenge and refine our own perceptions. Anti-Semitism is only one of the factors shaping European attitudes and policies on the State of Israel. 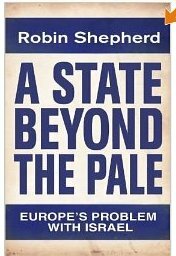 Robin Shepherd gives a thorough analysis of Europe's history concerning Israel and the Jews, on the way providing much needed explanations of attitudes among leaders and diplomats and different political groupings. Then, having painted a full picture of Europe and its attitude towards Israel, he goes on to discuss whether the USA can and will go the same way. Chapters - 1-Talking Israel down, taking Israel down. 2-Of Jews and Israel, 3-Fair Comment?, 4-Europe's broken back, 5-Muslims in Europe, 6-The Diplomat's dilemma, 7-Ideology against Israel, 8-Contagion: Is America next? - Conclusion. Europe, and especially France, has allowed immigrant Muslims to establish themselves in Muslim ghettos that are no-go areas for the police and authorities. In spite of strong talk, European leaders fail to act upon clear evidence that Islamists are forcing their values on society by exploiting our fear of Islamist rage and violence. See also Mohammed Cartoons Europe tolerates and appeases. The denominations of the Muslims is a factor, as is the question, "How many Muslims are radical and how many moderate?" 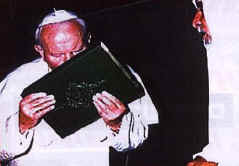 Pope John Paul affirmed the Vatican's policy of approval towards Islam. ("The Church's relationship with the Muslims"). Thus he breaks the Biblical commandment not to venerate any strange gods, in order to give Muslims credit for holding to the faith of Abraham. This suggests that Rome is propounding a new interfaith-ecumenicity within a new international religious community in which Rome enjoys a priority as founder and senior partner. See Islam and Babylon if it is not apparent why this should be a problem. Such a position is a serious U-turn for a church that condemned Islam for six centuries and crusaded against it for two. Two things stand out about European foreign policy: the loftiness of the rhetoric and the timidity of the deed. "The hour of Europe has come", said Jacques Poos in 1991 after the diplomatic mission to keep Serbia and Croatia from going to war. In the end the EU shirked its responsibility resulting in the massacre in Srebenica that the Dutch presence failed to prevent. European states speak collectively but act independently. The benefit of this arrangement is that it gives the authority to make pronouncements but not to incur the financial, political and social costs of imposing its will. Europe, and particularly France, regularly capitulates to trade unions, French farmers and illegal immigrants, but has an even worse record for capitulating to the Arab world. Europe has released terrorists in response to aircraft hijacking and accommodated terrorists from the PLO, PKK and Tamil Tigers. In France police regularly overlook looting rampages in Arab neighbourhoods, and assaults on Jews were treated with indifference until the political pressure grew too great. Israel’s policy of standing against terror is in stark contrast with the French way and failure to protest against it would destabilise its own fragile control of its Arab communities, but there appears to be something yet deeper behind Europe’s hostility to Israel. It is suggested that Europe is proud of its powerlessness, as a proof of superior virtue; to be seen in the pacificism of Europe’s Green parties but also derived from European history of loss of Empire and decline. Europe appears to be comforting itself for its loss of influence by adopting a posture of having accumulated great wisdom and virtue from the process of decolonialization. It also appears that Europe was much more pro-Israel in its early, powerless days but now resents Israel's success and firm resolve in the face of world opposition and Arab terror. The continent of Europe was named after Europa by Charlemagne. Greek mythology/religion was obviously well known to John as he wrote down his revelation, and he expected his readers to be aware of its significance. 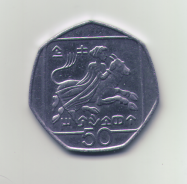 The rear face of a Greek 2 Euro coin carries the image of the woman (Europa) riding the beast, as does this Cyprus coin and this UK postage stamp . 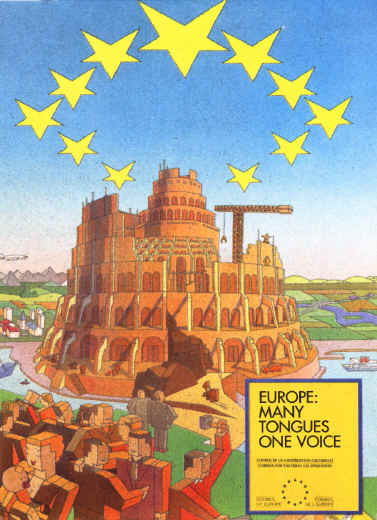 The European Parliament building in Strasburg, was designed by Richard Rogers using strong design references to Pieter Brueghel the elder's painting of the Tower of Babel, with its "not completed" appearance. Babel, you will recall, was the symbol of man's ambition to exalt himself above God. The BREXIT campaign to get the British to vote to leave the EU has produced an excellent feature length video explaining the problems with Europe, and the reasons in favour of leaving. Europe's conscious use of the symbolism mentioned above, reinforces the impression that Europe is being created to exalt human importance above God, for the political aggrandizement of those concerned. Dr Jurgen Buhler explored this side of Europe very well in his address at the ICEJ Feast of Tabernacles in 2003. The EU has evolved from a Free Trade Association to a political union and is moving towards becoming one huge country with no borders, one currency, one security policy, one foreign policy and a common justice system. It is now possible to drive from Estonia to Portugal with no border controls. This was the essence of Maastricht 1992. 1995 saw three new member states and 2004 will see ten more. Turkey (Islamic) is a prospective member and the "Barcelona Process" aims to link to North African countries. One major reason for founding the EU was peace, and that was certainly achieved as there has been no war in central Europe for 50-60 years. However, there are grounds for concern about the price of this achievement. In June 2003, a "Constitution of the United states of Europe" was published. In the preamble there was mention of being, "an example for the world of the New World Order" and, "Since ancient times Europe has been the carrier of culture." The ethos of United Europe is Humanism and, "Liberte, Egalite, Fraternite – the slogan of the French Revolution runs through the rhetoric. There is much more worrying material about European ambition and pagan organizations upon which this author is not qualified to comment. The DVD, "Jacob's Tears" from the Hatikvah Trust looks at the German paganism that ran through Adolf Hitler's beliefs and policies. The purpose of this page is not to sidetrack you into political activity, but to encourage you to see the signs of the times, to look towards the return of our Lord and Saviour and to be found ready.